At the tender age of 10 Catherine asked for filing cabinets to store her Archie comic books. Alphabetically. That was just the tip of the iceberg. Catherine has been organizing ever since. Catherine decided to make her part-time hobby a full-time profession in 2006. And so, all in row was born. 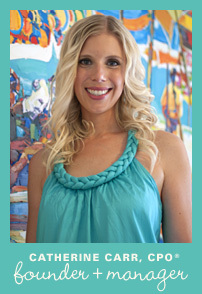 Catherine works with individuals and small businesses to de-clutter, simplify, and organize their homes and lives. She believes that organizing is personal and she works closely with each client to create a system that not only gives them more time, space, and control, but also fits their lifestyle. Catherine is a Certified Professional Organizer and an active member of several professional organizations that keep her educated on the latest industry news and trends. You can learn more about some of these organizations on the FAQ page. Learn about our services and our process.